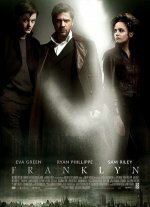 Franklyn Movie Reality hasn't got a prayer. The story of four lost souls in a futuristic London society where there is no separation between Church and State. added the tagline: "The path of single bullet decides the fate of four lost souls." added the tagline: "Reality hasn't got a prayer."